3-2-1 HAPPY NEW YEAR! That time is here and you have made your New Years resolutions, but what are your plans to grow your ministry in the next year? When I create my New Years list it always includes trying to save money, going to the gym more, or the hardest: drinking less sweet tea! What milestones can we set for a new year of children’s ministry? How can you better enable your volunteers? Volunteers are the muscle behind any kid’s ministry and it is important to have a plan to take care of your volunteers and be sure that they are given the proper tools to succeed in ministry. Send out an end-of-year survey and ask your volunteers for ways that you can better serve them or how they feel the ministry can grow. Then do it! Make your volunteers feel heard by getting them those extra crayons and markers or by looking at class sizes to be sure that the teachers are being utilized to the best of their abilities. Simply making a plan to give all of your volunteers a thank you note by June can really make a difference. These volunteers pour into the kids every week and having a plan to invest in them is important. Take some time to examine the curriculum that you are using at your church. Different programs fit different churches, and it is our goal at LifeWay Kids to create a curriculum that will fit your church. We offer 3 different starting points for you to base your ministry on, whether it is Bible Studies for Life, The Gospel Project, or Explore the Bible, LifeWay Kids wants you to find the best fit for your ministry. Do you know what else January 1st means? It also means that Group Leader information is now available! It is never too early to start planning for camp. You can start scheduling your parent meetings, plan some fundraisers or events that will promote camp, and get your kids ready for a fantastic summer. VBS is also just around the corner! Come check out VBS Preview events and take your VBS to the next level. We are so thankful for all the work that you put in as a children’s minister. We understand the long hours that you spend loving kids and their families and the dedication that you have to make God’s name known to these kids. As you make this list of all of the ways that your ministry can grow this year, take some time to make a plan of how you can grow in your walk with God. Schedule extra time to help you in your personal walk with God and everything else will begin to fall into place as you seek His guidance in this ministry. We hope that 2015 is an amazing year for you and your ministry! Keep us updated, we love to hear what God is doing in the lives of your kids all year long. When it Rains, do you have Plan B? When it rains at camp, some places shut down and put in a movie, but we always have a back-up plan and do everything to make sure kids get a great experience despite the weather. Track times or recreation games may have to be adapted, but we still have fun. No matter what adjustments we have to make, we continue to share spiritual applications and make the gospel clear for kids. At camp in the summer, our camp directors are always watching the local weather, but also watching the weather that is developing and heading their way. A couple of summers ago, one of our camp directors told me,”It’s raining in Jackson .” She then asked me what I thought about the afternoon. I didn’t have any idea what she was talking about — but we were in North Carolina and she saw that it was raining in Jackson, TN and headed our direction later. We still use that phrase, “its raining in Jackson” to reference planning ahead. We try to anticipate as many things as we can and prepare for them. In your church’s ministry, you can also prepare for a “rainy day” so you don’t have to shut down your kids program just because of something unexpected coming up. Give kids the best experience possible – and above all, make sure you communicate the message of Christ. when planning outdoor events, know what your options are for heading indoors. keep band-aids and headache medicine in your bag at all times. These may prove helpful for kids or volunteers. have a bag of tricks for when “big-church” goes longer than planned and you have to keep the kids for parents to pick them up. make sure your contacts/calendar/notes/plans are backed up somewhere other than just your phone. If your phone takes a plunge, then you need to be able to function! schedule your most important tasks early if you can. As the day goes on, there’s more opportunity for the unexpected to happen. keep a gospel tract in your Bible so its handy whenever the opportunity arises to share the message of Christ with a child or parent. on a longer timeline, develop young leaders because you never know when a key volunteer will take a new job, get pregnant, or be called to serve in another area. It pays to think things through before a crisis hits. You never know what’s around the corner, but don’t let that make you paranoid, just train yourself to anticipate possible challenges, be prepared, and have a plan b! If you have been following our culture posts you have read about Striving for Excellence, Making It Fun and Building Life-Changing Relationships. Catch up if you have missed one or two. We find these culture statements important with our camp, because they guide our actions regularly. Today’s topic is replace yourself. When talking with staff, we choose to say “replace yourself.” As we discussed the “Replace Yourself” statement when we toyed with different phraseology, which can totally change the dynamic. We wanted to convey the importance of raising up the next generation to pass the baton of our mission to them. We considered “replicate yourself”, but it strikes the wrong chord. Replication means you are making a carbon copy of yourself. From experience I know I cannot be a great someone else, or even a good someone else. However, I can be the best Collin maximizing my strengths and working on my weaknesses. Replace yourself means you will work to invest in others, because you have the realization you cannot do everything by yourself and you are not always going to be where you are currently. Here a few techniques we use to make sure we are replacing ourselves at camp. Walk and Talk – When you are headed somewhere with one or two people look to invest in them. Take advantage of your uninterrupted time and make everything a teachable moment. Pursue your People – A huge mistake a leader can make is inaccessibility. Maybe you have told your team “my door is always open.” Truthfully, that is not enough. You need to go to your people or you need to invite them into your environment. To create opportunities to replace yourself in others you need to pursue your people. Delegate – First decide what only you can do. There are things you should not delegate. However, often times you can empower others by delegating tasks to them and supporting them through it. Ultimately, replacing yourself is a spiritual mandate we should all follow based on the Great Commission. If you are not first replacing your faith in others, you are missing the mission in our walk as believers. Today consider in whom you should be replacing yourself and how you can accomplish it. 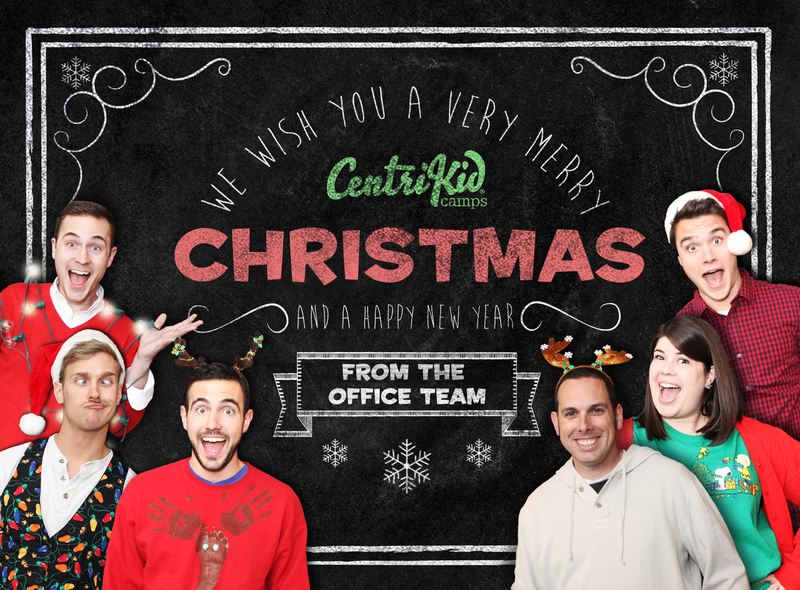 Merry Christmas 2014 from CentriKid! It’s the most wonderful time of the year! Whether you are opening presents by the fire, traveling to Grandma’s house to gather with extended family, or enjoying other fun Christmas traditions, we hope that you and your family have a blessed day as you celebrate the birth of Jesus Christ! Christmas is a wonderful time to get together with family and spend time with one another as we celebrate the birth of Jesus. As Christmas rolls around every year it gives families a chance to create some really fun and meaningful traditions. Let’s take a look at some traditions that the office team takes part in! JE and his wife and daughter do a December daily activity, which could be making cookies for neighbors, ordering pizza and watching “Elf”, and pictures are taken at every activity for scrapbooks to remember all the fun December activities done year after year. Henry’s family meets at his great uncle’s home and shares a meal together on Christmas Eve. Then they sing Christmas carols, and the youngest family member that is able reads the story from Luke 2. There is also an exchanging of gifts and an intense wrapping paper war which is a little like a snowball fight. Also, Henry and his dad pass a knife back and forth every year at Christmas. A tradition started with Henry’s Grandad and his youngest son. Collin’s favorite tradition started when his Nana was a little girl. Every year their family has a Christmas Eve Program. A lot of the songs and activities are the same each year, but sometimes there are fun performances by cousins or aunts and uncles (e.g. clogging, performing “Grandma got ran over by a reindeer”, etc.) The family eats the same food Nana ate as a little girl including tuna sandwiches and salsa. You might be thinking, tuna is not a special Christmas food, but for his family it is. These are traditions that Collin hopes to continue as his family grows, tuna fish included. Micheal gets a new Snoopy ornament from his Granny every year, which is his favorite Christmas tradition. He also always makes sure to “White Christmas” and his favorite, “Rudolph the Red-Nosed Reindeer, and also eats breakfast casserole on Christmas morning with his mom and dad back in Mississippi. One of my favorite things that I love doing is driving around looking at the lights. This was something I did with my Papaw and enjoy doing year after year. Baking cookies with my mom is also super fun, even if we mostly just laugh at how the gingerbread men do not look exactly like they should. Christmas is a beautiful, wondrous time to spend time with family and a perfect opportunity to remember the true gift of Christ.